Butch calls his musical style AmeriFolknBluesAcana which does start to sum up his eclectic mix of his roots based sounds. The newest artist at CMI Records (Cash Mattock Inc) isn't a new kid on the block, but just because Butch Barnette took the slow road to success doesn't mean he doesn't have talent. The most laidback artist on the label admits that his first record has been a long time coming because he hasn't made fame and fortune a priority. This keeps such distractions from getting in the way of his music and fits well with Barnette's easy-going personality. "I want to be able to laugh it off," he said. "I don't ever get to the point where I take myself seriously." That doesn't seem to have affected the humble singer/songwriter's musical talents at all. The Westfield, Massachusetts-based musician is hoping to complete his debut album by March 2009 and judging from the rough cuts done to date, his vocals, harmonica and acoustic guitar work stack up well against the best in the business. As a child, he saw the classic broadcast of The Beatles' appearance on The Ed Sullivan Show and said to himself, "I want to be like that." Barnette took up guitar around age 14 or 15, but didn't put much effort into it at first. "I always wanted to be the next Hendrix, but I never really got to that skill level," he said with a laugh. Instead of copying the styles of others, he has always put more effort into developing his own. "For the most part, I never tried to learn anybody note for note." Barnette did not join his first garage bands until he was in his 20s. He did not play his first gig until the late '80s, at a bar in Golden, Colorado for $50 a night. "They kind of sandwiched me between the jukebox and the cigarette machine," he said with typical good humor. Since then, he has played some clubs and open stages, but did not garner recognition in proportion to his talents. That began to change when he submitted some of his work to CMI Records. The label provides an opportunity for artists to have their work reviewed and possibly sign with the company, through its profile at Sonicbids, Cash Mattock Inc CEO Cash Mattock said. Artists create electronic press kits through Sonicbids, which allows them to bundle at least three songs, biographies, videos, photos, reviews, set lists, requirements for playing out, touring calendars and other promotional materials. Sonicbids members can submit their work to CMI (Cash Mattock Inc) for review. Barnette was the first artist CMI has signed through the process and Mattock was not disappointed. Seeing him play acoustic guitar and harmonica simultaneously while recording his rough cuts was a break from the tedium that sometimes sets in while working in the studio, Mattock said. "I guess it's a departure from the rest of their catalogue," Barnette said. Instead of garage rock, his work fits more on the "folk and blues" end of the spectrum, but that doesn't stop him. "They're kind of eclectic. I'm not one of those who sits down with an idea in mind and sits down to try to flesh out a dream," he said, then added that. His style is neither that of a coffee house musician or a house band. "Some of my songs would do well in a band setting, but I'm mostly a folk singer, with some blues influence." At times Barnette's work is reminiscent of Van Morrison, one of his favorite artists along with other singer/songwriters like Jimmy Buffet, Willie Nelson, Waylon Jennings and Hank Williams Jr. Dylan was also one of his earliest influences. A heavier sound sometimes shines through, however, perhaps because of his early appreciation for artists like Eric Clapton, James Gang and UFO. One of his biggest influences is singer/songwriter John Prine, whose songs sometimes tell tales about downtrodden and unfortunate people cast away by society, like Vietnam veterans, junkies and the elderly. "He had a sensitive side but also a humorous side." Barnette said. "You almost felt like he was sitting in your living room, telling you a story." He is considering putting a tune on the album that was influenced by one of Prine's songs, about an elderly couple forgotten by everyone else. "The Pensioner" was written one holiday when Barnette "was grousing about one thing or another," until he heard a sad tale in the news about two old folks had frozen to death in their homes. On the other hand, Barnette can lighten the mood in a heartbeat with more humorous material. "There are other ones are not that politically correct," he said. One is titled "Coyote Ugly" after an old joke about one night stands that is "crude, but just damned funny." "The first time I heard that, I laughed so hard I hurt. The song is basically about that." Barnette is considering using another tune, "I Guess I'm Lucky," as the album's title track, because it fits the circumstances. Not long after signing with CMI (Cash Mattock Inc) to do the album, he was nearly killed when a train hit his vehicle. "I guess that would be a good album title, simply because I'm still here," he said with a laugh. "It was a near fatal accident and I spent nearly three months in the hospital. It happened in late October and I didn't get out till January 15th, somewhere around there. I had some close calls. There were some times where they didn't think I was going to make it through the night." "My family has been really supportive. My eldest brother, older sister and younger brother came out and stayed with me the whole time I was in the hospital. Instead of complaining about the mishap, Barnette has handled it with typical good humor and cheer. "I'm just glad to be here," he said with a note of genuine appreciation. Now that the project is back on track, he hopes to have the record released sometime between fall and New Year's. After that, he aims to take his career to new heights. "Definitely, I want to do a release party for it... I'd love to tour." On the other hand, Barnette isn't suddenly gunning for fame and fortune. His best incentive is merely the appreciation of other bands. "When other musicians hear my stuff and tell me that they like it, that's when I appreciate it and want to keep doing it." 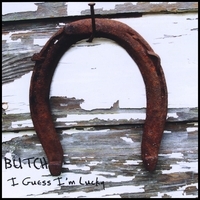 Butch’s debut album “I Guess I’m Lucky” will be released on St. Patrick’s Day 2009. This album is one of CMI’s greatest achievements to date. Butch calls his musical style AmeriFolknBluesAcana which does start to sum up his eclectic mix of his roots based sounds. Each song of this album is a well crafted story that only an artist like Butch can tell. We can’t wait to have this album added to our catalog and when you hear it you’ll have to have it too. We feel that his music appeals to young and old alike. If you appreciate great song writing you’ll have to hear this album.